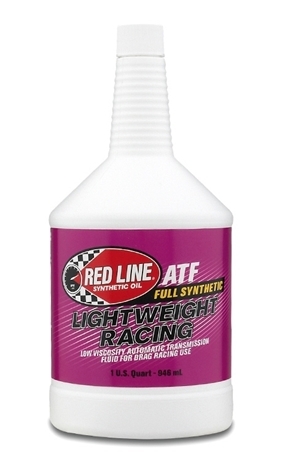 RED LINE LIGHTWEIGHT RACING ATF is a full-synthetic formula designed specifically for use in drag racing automatic transmissions that need the positive shift of a Type-F automatic transmission fluid, yet require ultimate consistency. This ATF contains no slipperiness additives, producing faster shifts and quicker lock-up and can reduce elapsed time in drag racing. Compared to RED LINE RACING ATF, this product maintains a comparably thin viscosity to minimize heat buildup and reduce changes in fluid thickness between rounds. This product is designed for use where Type-F, Dexron, and Mercon fluids are recommended in both bracket and heads-up drag racing transmissions.